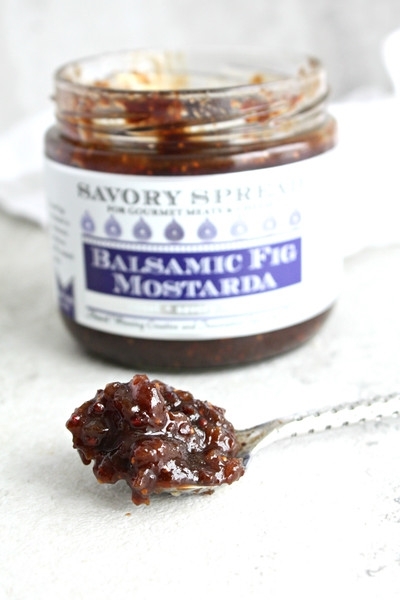 Sweet figs, raisins and fresh pears are simmered in a balsamic reduction with a touch of hot mustard spice. 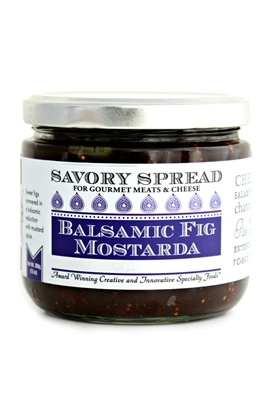 This gourmet savory spread is ideal for cheese pairings. Try with an aged goats cheese, Vermont Creamery's coupole and blue cheese. Pairs brilliantly with charcuterie and roasted red meats. Makes a fantastic gourmet sandwich spread and the perfect addition to any gourmet gift basket or cheese board. Ingredients: Fresh Pears, Brown Sugar, Organic Dried Figs, Red Wine, Balsamic Vinegar of Modena, Raisins, Ground Mustard, Mustard Seed.